Comment: Outstandingly clean for an emerald, intense 'open' blue-green gem from Zambia. 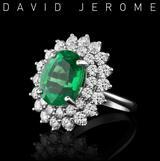 'Very lightly included' is a compliment for every emerald, as you may know. Not 100% closed in the center but so vividly shining throughout the latter that I dare call the window insignificant. It is also often 'reflected-away' as in the main image. The flashy luster and its electric hue may not be well suited for the introverted because it attracts the eye from across any normal sized room. 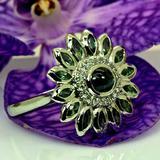 Few people know other green gemstones than emerald, hence they may embarrass you with public questions about its authenticity, speculating that it looks too good to be a 'real emerald', and thereby, even more embarrassing, insinuate that you or your partner would lack the funds for a 'real emerald'. To counter-embarrass you could answer: "Oh, yes, real emerald but it is oiled. Cedar only, though." Snobbish? Perhaps. In any case, not for the introverted. As you may have seen, minor clarity enhancements with colorless oil (the millennia old 'cedar treatment') have been accepted in our stock since 2015. If you are interested why, please read here about the background. As always, our prices include global shipping, original gem lab report, 1000sqm of WLT rain-forest protection, and fight for animal rights in NY, grading papers, and all WildFish extras.